An improved version of the three-dimensional platform game from 2005. It is based on the popular comics about Asterix and Obelix. The game features many action sequences and a large dose of great, abstract humor. Asterix & Obelix XXL 2: Remastered is a refreshed version of the three-dimensional platform game from 2005. It was released on PS4, PC etc. and it was based on the comics created by Rene Goscinny and Albert Uderzo. The game is filled with action and a large dose of humor and it enables the players to assume the role of the two titular Gauls. The remastered version was developed by Microids. The original version was created by Etranges Libellules. The players assume the role of Asterix and Obelix. The game takes place during the age of the Roman Empire. All druids in Gaul had disappeared. Only Getafix, the friend of the protagonists, remains. However, he behaves weirdly and he can die at any time. It seems that, in order to solve the mystery of the disappearance of the druids, the protagonists will have to travel to the amusement park known as Las Vegum. Asterix & Obelix XXL 2: Remastered is a classic 3D platform game. The protagonists are observed from various perspectives (usually from behind their backs, but the camera is rotating during the game). The players must explore Las Vegum, avoid traps, fight Roman troops, and discover the main story plot. The city is divided into a few large districts like Little Paris, LuckSore, WCW, Little Venetia, and Pirate Island. The players can count on the help of Sam Shieffer – an ex-Roman spy who can teach the protagonists new tricks. Some characters encountered in the game are parodies of known video game characters like Sonic, Mario, and Lara Croft (Lary Craft is one of the bosses in the game). The same goes for the above-mentioned Sam Shieffer who references Sam Fisher, the protagonist of the Splinter Cell series. 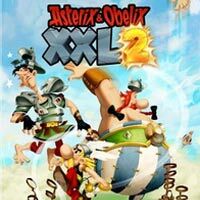 Asterix & Obelix XXL 2: Remastered features only a singleplayer mode. Asterix & Obelix XXL 2: Remastered features very colorful, three-dimensional graphics. It was refreshed to fit modern platforms and standards. The soundtrack of the game references ancient times.